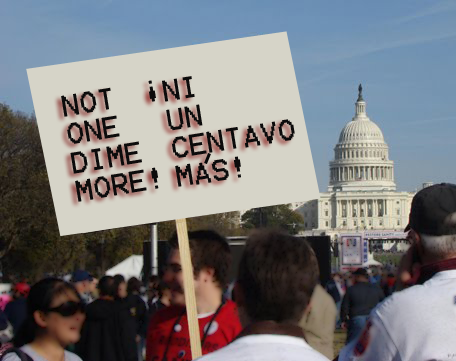 NOT ONE DIME MORE UNTIL …. A message from a small business owner to the administration and Congress. Like many of you business owners, I too recently completed my taxes and cringed at how much of my money is going to Washington DC. Mind you, I don’t mind paying taxes. I understand there are roles the federal government has a constitutional obligation to perform (defense, regulate commerce, regulate immigration, coin money, etc…) and as a “customer” of these services it is my duty to help fund them. I also understand the federal government is not a private company and thus by it’s sheer size cannot behave like one. Despite this I think it is reasonable to expect they will strive to adhere to common prudent business practices. The top three as a I see it are: (1) be fiscally conservative and sound (solid balance sheet), (2) be good stewards of the funds they receive from tax payers by searching for ways to remain lean and efficient and avoid waste, and (3) never lose sight of who your customer is and try your best to meet or exceed their expectations. The recently publicized lavish ($822,000) Vegas trip taken by GSA (government) employees was a gross violation of trust. Add to this the $523,000,000 dollar federally backed loan given to now bankrupt solar start-up, Solyndra, one has to wonder if there is a business person among them in charge. When a business is forecast to have red ink on their balance sheet and they know their customer will be extremely sensitive to any price increase they focus first internally to find a solution. They start by tackling internal waste. Then they ferret out and eliminate “nice to have” versus “must have” spending. And lastly and most regrettably a company will look at their people – evaluating and cutting layers of management and staff – learning how to do the same with fewer. It is only after they completely exhausted these stressful steps do they come humbly to their customer and make the case for raising prices. This is a process that has been taking place and continues to take place in businesses large and small since the very first business opened its doors. It is time we ask our federal government to do the same thing. That before nonchalantly asking us, their customer, for one dime more we must insist they exhaust every means to internally bring down their operating budget now. Let your voices be heard America and tell the folks in DC …..
Not one dime more until each of the 15 cabinet departments (Treasury, Defense, etc…) and the multitude of their subordinate agencies (see entire list here) completes a thorough review and cut of wasteful spending. Not one dime more until these same agencies candidly review the necessity of all discretionary and operational spending. In a time of fiscal crisis if it is not an absolute “must have” then they should learn to live without it. Not one dime more until each and every agency conducts a thorough review of management layers, administrative staff and the workforce. Most companies have to deal with this at some stage in their lives. The federal government is no different. A high national unemployment figure is not sufficient rationale for skipping this step. The goal is an ultra lean organization void of perks. And finally, not one dime more until Congress reviews every single appropriation ($3,769,000,000,000). Are these “must have” spending or “nice to have”? I would argue that in the fiscal climate we are in today a $500 million loan to a solar start-up is not a “must have”. I realize these are painful, difficult steps that will have personal and political ramifications. Politicians will have to let pet projects and agencies die. Those who remain will have to learn to do more with a lot less. Businesses and State governments have to weather these storms when they are in crisis, our federal government should do the same. When the spending is actually cut and the excess people let go our legislative and executive branch leadership should report to their customers (tax payers) on the outcome and new state of the federal balance sheet. Then, and only then should they be allowed to start the debate about how much and who should cover the remaining deficit. But not one more dime until this is done. Let’s put an immediate stop to any conversation of tax increases and compel our leadership to prove they can for once do the tough part of cutting waste, non value-added spending, and staff now – not in 2016 or 2020 - NOW! Not one more dime until then.